"All Still Part of Lost Ones,"
The latest show at the Brattleboro Museum & Art Center, Spirited Women: Ten Vermont Artists, is an eclectic collection of sculpture, paintings and movable installations. The show is a smorgasbord of unique artist voices expressing themselves in original and compelling renditions of texture, movement, shape, tone and color. Their works posit more questions than answers in the viewing. The women's works are mysterious and require time to contemplate their hidden meanings and evocations. Three women, Dana Wigdor, Susan Rees and Patricia Burleson, hail from the Southern Vermont communities of Brattleboro, Bennington and Townshend, respectively. 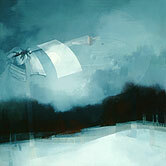 Dana Wigdor's paintings are well crafted in tone and structure. Using only three colors, she presents refractions of painted light breaking over cool, wintry landscapes as atmospheric stagings for tiny mechanical "beings" from her unconscious. 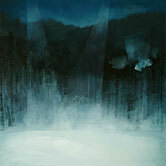 The effect is subtly theatrical as these "beings" hover like alien hang-gliders over the cold and prismed land. In her most recent artist statement, Wigdor explains: "These are imaginary sentient beings who float through my imagery. I want them to appear to have feelings of their own: hopeful, curious, lost, yearning. They are my people, developed by a process of spontaneous scribbling, alternated with layers of thick landscape imagery. They arrive in the painting by an intuitive process of elimination; the encroaching landscape slowly cropping and defining their contour until their shape and position is completely realized." The works are doodles of a child's world of magical, mechanical toys flying in the sky. The paintings seem to be a bridge between the cerebral, structured world of the adult and the fantasy of childhood musings. Usually people respond to Wigdor's work by asking if the images in her paintings are UFOs. She notes, "They are unidentified flying objects, but I'm not a UFO enthusiast." People seem to find their own stories in her paintings. She explains how she is "not spoon-feeding imagery; it's something you haven't seen before." Dana Wigdor has been invited as a guest artist by Petria Mitchell to display her more recent work at Windham Art Gallery's "Shared Inspiration" show opening for this month's Gallery Walk. Sue Rees has an extensive sculpture, stage and lighting background from teaching at Bennington College. Her work also displays her dabble in architecture. 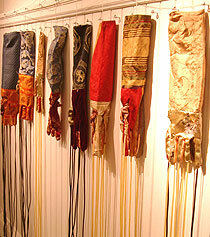 Her installation "All Still" is a series of brocaded gloves or gauntlets, regal in size and material used. There is a series of strings and gears which, when a switch is turned on, will quiver. She made them as part of a larger installation, "the lost ones," produced after a trip to India. She explains: "I did a residency in Modinagar, India. After observing the gesture of hands in greeting, touching and acting, I knitted gloves with three, four, five and six digits out of strips of multicolored saris." Rees explains the lack of the human figure in her work but instead using articles of clothing to evoke the human presence: "By implying the human presence or objects which refer to the human, it allows the viewer to place him or herself within the world of the objects, or to remember past actions, or past stories." It is an opportunity for the viewer to experience the installation in one's own individual humanity. The basket-nests of Patricia Burleson seem to be whimsical at first, but in longer viewing are profound statements on the artifacts of women's lives and the world's detritus. In "Dream," there are dolls, tape measures, zippers, bottle caps, a Statue of Liberty, mini-clotheslines. It is like your grandmother's sewing box, where a lifetime of handiwork and mothering is contained in one nostalgic "nesting." "Paz I" and "Paz II" are baskets of the world, including globes of the earth, ribbons, bones, scraps of material, rhinestones, every little thing some large bird collected for a nest encapsulating elements of the world's tragedy. Soldiers and body parts of dolls lend the pieces a sadness on the state of the world. Other Vermont artists in this show are: weaver Elizabeth Billings of Tunbridge, sculptor Kathryn Lipke Vigesaa of Waterville, painter Janet McKenzie of Island Pond, sculptor Lynn Newcomb of Worcester, sculptor Kathleen Schneider of Winooski, and sculptor Barbara Zucker of Burlington.